Pre-purchase help on preventing unwanted connections. I took the plunge and bought one anyway. If I cant figure out some kind of two factor before jumping on my WLAN I'll return this thing for a different brand. Welcome to the eero community and thanks for your question! There isn't a way to create MAC address filtering. 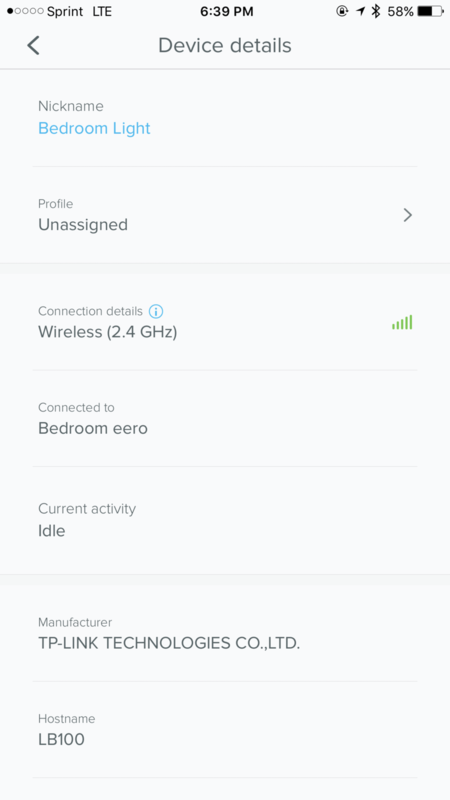 However, from within the eero app, you can monitor all connected devices on your network. If there is one you don't recognize, you can easily block that device from within the app ensure it can't continue to use your internet. is there any kind of alerting when a new device connects? Not currently but there is an existing feature request thread here. Glad Scott was able to get you a link to that feature request! While there isn't a current notification feature, as previously mentioned, in the eero app you can actively monitor all devices on your network. In the app you can see the number of devices actively connected and the device details. I've added a screenshot below. Another feature that may be of interest is the ability to create and manage a guest network that you can easily turn on or off in the app. If you'd like to restrict access to those who shouldn't always be on your network, you can utilize this feature as well.